The England midfielder appears to have dropped to sixth in Chelsea's midfield options and has only featured for 22 minutes so far this season. 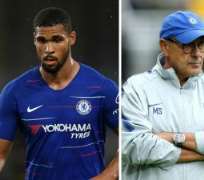 Loftus-Cheek had hoped that after his promising loan spell with Crystal Palace which earned him a place in England's World Cup squad would give him a chance to play regularly and continue his development under new Chelsea boss Maurizio Sarri. With N'Golo Kante a nailed-on starter each week, and Ross Barkley and Cesc Fabregas seemingly ahead of him in the pecking order, Loftus-Cheek is growing frustrated at his lack of opportunity despite frequently told to be patient by Chelsea management. The Blues' stance now has him fearing for his England chances with boss Gareth Southgate set to name his first post-World Cup squad on Thursday.